The Flexible Flyer Play Around Metal Swing Set gives your kids and their friends a safe place to play all summer long. 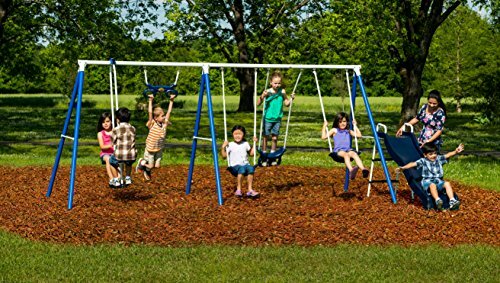 With six different activity stations including two swings, a air-glider, trapeze, shoe loop swing, and a slide this swing set will keep up to seven kids busy at once. The powder-coated steel frame has a UV colorant coat to keep it from fading.